As a long time goal setter, I’ve always struggled with the rigid constraint of a goal. You set specifics and design action steps, but something always happens along the way. In the past, I’d set a goal or three for the year, and then sub-goals for each month. Then I’d figure out what action steps to take each week and each day, and try to focus my day on those steps. Unfortunately, it never, ever works out this neatly. You all know this. You know you need to work on an action step, and you try to keep the end goal in mind to motivate yourself. But this action step might be something you dread, and so you procrastinate. You do other work, or you check email or Facebook, or you goof off. And so your weekly goals and monthly goals get pushed back or side-tracked, and you get discouraged because you have no discipline. And goals are too hard to achieve. So now what? Well, you review your goals and reset them. You create a new set of sub-goals and action plans. You know where you’re going, because you have goals! Of course, you don’t actually end up getting there. Sometimes you achieve the goal and then you feel amazing. But most of the time you don’t achieve them and you blame it on yourself. 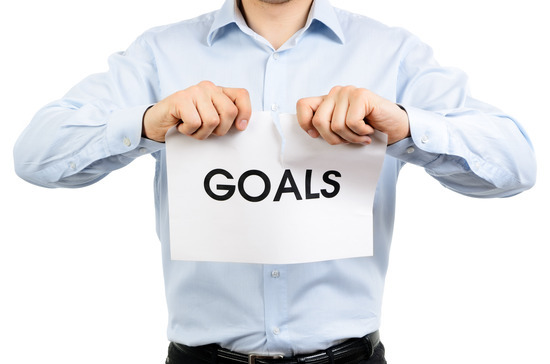 I’ve found that most goals exceed our motivation to do them. 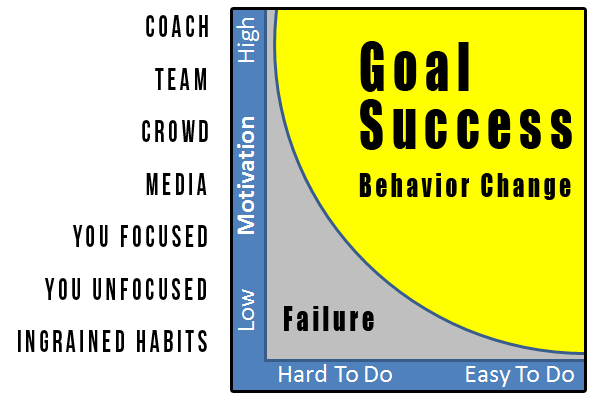 This chart shows where the problem lies… We usually set extensive and specific hard-to-do goals that fit clearly in the failure zone of this chart. As a creative, I’ve failed many times here. Leo suggests living a life without goals. He explains it this way… So what does a life without goals look like? In practice, it’s very different than one with goals. You don’t set a goal for the year, nor for the month, nor for the week or day. You don’t obsess about tracking, or actionable steps. You don’t even need a to-do list, though it doesn’t hurt to write down reminders if you like. What do you do, then? Lay around on the couch all day, sleeping and watching TV and eating Ho-Hos? No, you simply do. You find something you’re passionate about, and do it. Just because you don’t have goals doesn’t mean you do nothing — you can create, you can produce, you can follow your passion. And in practice, this is a wonderful thing: you wake up and do what you’re passionate about. For me, that’s usually blogging, but it can be writing a novel or an eBook or my next book or creating a course to help others or connecting with incredible people or spending time with my wife or playing with my kids. There’s no limit, because I’m free. Never Set Goals?? While I generally share Leo’s idea, I do think it needs some structure. And it ties in with two things I’ve talked about for years.. I like to have a general idea of where I’m going, but I like the freedom of spontaneous creativity. In fact, I’ve found that the minute that I get too rigid with my plans, I fail. I like to create time based habits based on the Power of 48 minutes. This works very well for items such as blog posts, writing fiction, creating content, or working with social media. It gives me the flexibility to be creative, with the structure to get things done. Here are a couple of examples how I put it together. Session two: Write a chapter for a non-fiction book. If I get finished, great, if not I set it aside to a following day or time, but I do get things done without distractions. To make this even better, I usually start out the day with a 12 minute session where I write down my top priorities in my daily planner. Here again, the secret is to be flexible. Once I have the priorities written down, I choose one and plug it into my 48 minute focused work plan. Structure with flexibility and creative freedom. I do set longer term goals, such as writing a specific non-fiction book, describe a general outline of a fiction work, or define a product I want to create. But I leave the specific details as open as possible. This allows my creativity to flourish, but has enough structure that I get things done. Compared to ultra defined goals, this program rocks!